Overall a well-written book with a decent plot. Reading the book would have been a bit less confusing as some of the pronouns for the omnisexuals (S/he and he/r) weren't properly verbally explained but have been obvious in print. As title suggests the book starts out a little slow and the narration was somewhat confusing in the beginning before you sort out that different timelines are being utilized. Gender neutral pronouns were used for various characters and it took me an embarrassing amount of time to realize what was going on so it was a little confusing for a while. Overall great beginning to what I hope will be a truly epic story. Hamilton read by Lee, what else do you want? One of the greatest science fiction writer of this age read by the greatest voice in audiobooks. It's is a very tantalising start to a new series, can't wait for the rest, this is pure Peter F. Hamilton delight. Couldn't listen more than one chapter. Story seems to be promising, but.. another time, I guess, when I have time for paperback. 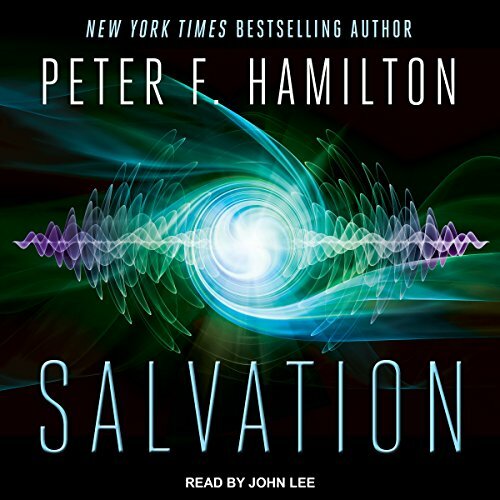 I had patiently waited almost 2 years for a new Peter F. Hamilton book, and, unfortunately, as expected _Salvation_ is a 19 hour introduction to this new series. It's a series of short stories setting up the arc with the bulk of the stories being back story for the main protagonists. Anyone who has read his Commonwealth series will see many similarities, though this is not the same universe. While not a bad book, I was quickly aware that no real progress was going to made, just lots of groundwork being laid so my advice is to wait for at least the second book to be published where some progress might actually be made in the plot. I love the author's series the Commonwealth and had a hard time putting them down but unfortunately this one was hard to finish. the Bland characters doing nothing of consequence that seems until the very end of the book makes it a tedious read that feels like a very very long prologue. Maybe this tale is interesting if not involving, somewhere near the level of the Bobiverse. Ok, maybe that's hoping for way too much. I couldn't make it past chapter 6. The narration was just too impenetrable, off-putting, dense. Some of that might be the text, as there is a fair bit of description, some of it fairly technical, though generally I enjoy that if it's at all logical or at least possible. The narrator gives each character pretty much the same voice, so it's hard to tell which character is speaking at times. And he tends to drop his voice at the end of sentences to almost inaudible levels. Life is too short to spend 15 more hours trying to get into this one. I really like the book -- the story, but John Lee is another matter. Which is odd because I have mostly liked his narration in all the other P.F. Hamilton books, but in this one his characters seem to meld together into some odd "Transylvanian" accent. Like something from a vampire cartoon. Not only that, but he will have an accent going for a character and it will shift into the vampire accent and I get lost immediately trying to figure out who is talking because now the next character has the same or similar accent. He has used this accent more sparingly in other books, and I have not liked it there either, but one or two characters. Okay. I can excuse/live with that. But smeared all up and down and over all the characters. No way. It takes away from the book because I am having trouble following the jumping from story to story, but add in not being able to follow who is talking and a mish mash of epic proportions ensues. I stop the audio, go back and try to sort it out. I can't always. Lastly, who speaks like this? Honestly, just cartoon vampires from Transylvania. It's not even a thick British accent as some have commented. Same author as Pandora's Star & Judas Unchained? Hard to believe. My heart was pounding as the Primes invaded Commonwealth space. Compare that to this story...I have no idea what is was about or the characters in it. Depressing. I forced myself to let it play...day after day. It ruined my commute. Yikes. Far to much like other PFH books with a very similar structure to Hyperion. A fun read, but nothing we haven't seen before. The narrator was fantastic as always. I made a mistake getting this book. Every book John Lee reads is nearly unbearable to listen to. He has no concept of how people actually talk apparently. Unfortunately I cannot finish this book I don't think. He completely ruins the entire story. It's like buying a book and getting home to read it only to realize it's been colored in by a first grader. 19 hours of which 18 of them were back short stories trying to set up a story. Nothing like his other works. I absolutely loved the Void Trilogy and was really excited to see a new series available. Unfortunately, I found this book to be common, plodding, droning, pedantic and boring. I couldn't make it. So sad, I really wanted to like it.